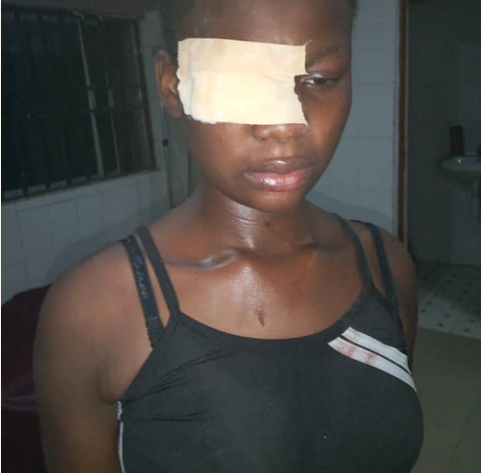 A 17-year-old girl named Ochanya Samson from Benue state, has been left seriously injured after she was molested and assaulted by a man in Abuja. According to Bakia Thomas, the teenage girl has gone through pros-titution and r*pe in a bid to survive after it was claimed that her baby which she had at 15, was allegedly sold by her uncles for N500,000. "I need urgent advice please. We met Ochanya Samson yesterday evening, 17years of age from Benue State. Seriously molested by a man who called on her and she refused to go, she almost lost an eye. Now we were together with Godsent M. Sadoh when we saw her entering the hospital. An orphan with no mother and father, her uncles drove her away because of her character, that version of the story was told to us after I got her treated yesterday. Now she lives with a woman who has also decided to send her away because she is scared of Ochanya's uncles. This girl has gone through r*pe, eventually had to go into pros-titution just to survive and just when she made up her mind to quit, this happened to her. Ochanya had a baby when she was 15 and her uncles who threw her away took her to Aba and sold the baby for N500,000 and took the money from her. Returning to Abuja, they got a house, same house they live now and they sent Ochanya away."